Sophie Kinsella introduces us to the irrepressible Becky Bloomwood, brought to life by the bubbly Isla Fisher; she of the multiple credit cards and overdrafts, the overflowing wardrobe closets, and that utter inability to resist the magic word 'Sale'. 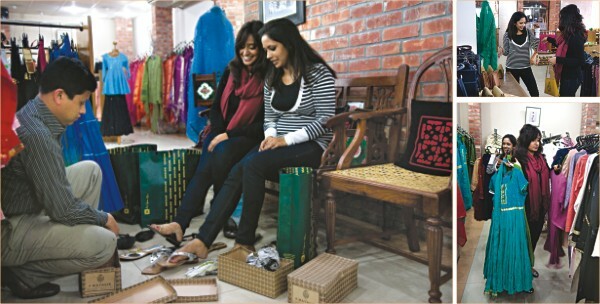 Retail therapy for this glamazon goes beyond simple obsession; it is her raison d'etre. Press conference to attend? She must get that gorgeous Denny & George scarf on sale, to make the right impression. Interview with the boyfriend's mother? She's got a complete new outfit, from hair accessories to shoes, and it's one of at least three sets she bought just for the occasion. Her own wedding? She had five 'back-up' wedding gowns. No purchase is deemed unnecessary for the Shopaholic, and no matter what the contingency is, you can count on her having bought the duds to look good while dealing with it. While Bloomwood is a fictional character, her unique selling point is inspired by real life. There are people out there, who would brave the crazy traffic jams, skyrocketing prices, and all other obstacles in their search for the ultimate high; a good purchase. Truth be told, this compulsive shopping is actually being considered as a disorder, and social psychologists have even come up with names for it. The term “consumption addiction” is now being used in the U.S. (and other consumer-oriented countries) to describe the need, desire, constant craving and compulsion to acquire possessions. Those with a consumption addiction have been labeled as consuming addicts, shopaholics, debtaholics, and spending addicts. Specific names for the disorder include oniomania, compulsive buying disorder, compulsive hoarding, and binge buying. If you thought the cutesy names are all that there is to it, think again. Even though shopaholism has historically been overlooked as a true disorder, studies estimate that one in every twenty people engages in impulsive and often unnecessary spending. Such individuals lack the necessary self-control to step away and resist the urge of buying a desired item - even at the expense of their finances or relationships. Things can actually get pretty out of hand, as Oprah showed us. In a 2007 episode of the Oprah Winfrey Show, the talk queen brought forward the case study of a couple whose 3000 sq ft house yielded 75 tonnes just in trash. The home-owners had appealed for help with the shopaholism that led to the clutter, and viewers watched with horror as experts on the show waded through the mess and cleaned out the overflowing closets and brimming boxes, to end up filling 15 dumpsters. How could anyone let that happen, right? “I am not a shopaholic. It's just that, I lose my mind when I see those big red bold letters spelled as 'SALE'. I go a little crazy when I am holidaying abroad and entering the malls. I rationalize and tell myself how badly I need 10 pairs of jeans and how all my t-shirts look old, how a new pair of shoes would be just perfect for those meetings. Price tags hardly matter. It's the new me that matters. What flash in front of my eyes are images images of me in Armani jeans or in Next t-shirts or Gucci suits. I always have a reason for buying something or the other even when I don't really need them. Thus I don't call myself a shopaholic till my credit card bill arrives. But whenever destiny brings me face to face with another such occasion the reasons arrive and the [not so] shopaholic me returns,” confessed Simon Mansoor, a dashing young executive. As Kinsella's Shopaholic series illustrates, this compulsion for making purchases is usually fuelled by denial. Becky actually rationalises her purchases as 'essential' or 'an investment', and even if one doesn't go to the extremes she does, it is easy to dismiss a random, unplanned purchase as a 'little' indulgence. Sales and discounts can also be misleading and counter-productive; one is tempted to take advantage of the marked-down prices, and end up buying more than one usually does. Unfortunately, unless one remains vigilant, the little figures add up and can spiral out of control. “I was in Kolkata for exactly 30 something hours, half of which was spent inside office buildings. Yet I managed to go touch down most of my favourite shopping haunts; Rangoli, Westside, Forum Mall, Newmarket, Oxford Book Store and of course Dakhinapan, and that too in just seven and a half hours. “I spent a little less than a thousand dollars, but somehow was feeling that if only I had a few more hours I could have done better. You can very well understand what a lost case I am; it's the euphoria, the adrenaline rush that I dig so much,” explains this lost soul, who goes wild and loses sanity everywhere from an unknown village haat to Saks Fifth Avenue. “Back in 2005, I was going through tempestuous times. I recovered from a near fatal experience leading to a coma and my fiancé had broken up with me, even before I stepped out of the hospital. Returning to the house, I faced utter boredom. My movements were restricted and so was my enthusiasm to reach out and mingle with friends. So I shopped. All day and all night I browsed the Internet and bid online. I had previous liaisons with some of the most established auction houses in the world, Christie's, Spink, David Feldman and Harmers from where I used to buy collectibles. Having previously conducted a few sound transactions, these houses were kind enough to give me credit, some to an astonishing figure. As you might have guessed already, my family didn't know about this but found out as soon as the reminders for payment kept coming in the letterbox. In a span of three months, I made purchases well over 40 thousand dollars. These bids were made to make me feel better, I hoped that I would be able to pay up but hope does not go anywhere near 40 thousand. In my defence, I could claim only insanity. I was in a very confused state, a blurry haze where all this happened so quickly. I wrote a letter to all the auction houses, placing my case, not hiding anything from them. Then all were exceptionally cordial. They pressed no charges, which they could have; did not file complaints in any of the societies I am a member of. They just let me go. The scare stories above are not meant to put you off shopping, especially if you love it. The thrill of spotting that perfect purse amongst an array of delectable offerings, the nervy anticipation with which one turns over the price tag to discover that lo and behold! the item is within one's means, the sheer pleasure of walking home with a shiny new purchase...all these provide a heady high, and you need not deprive yourself of it. The economy thrives on consumerism, after all. The secret lies in moderation; instead of going overboard, tot up a budget and stick to it. Watch your purchases carefully, and keep account of the 'impulse' buys, and you're on your way to shopping responsibly. All it takes is a little discipline, and you can have all the fun of shopping, minus the headaches. Special thanks to Mayasir for allowing us to do the photo shoot.